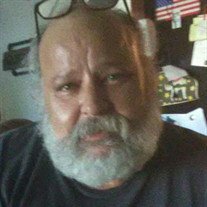 Denny Lynn Smith, age 55, of Albia, passed away on Sunday, February 10, 2019, surrounded by his loved ones, at Mercy Medical Center in Des Moines. Denny was born on August 21, 1963, in Iowa City, IA, to Raymond Benton and Ruby Pearl (Adair) Smith. He grew up in Fredrick and attended school in Eddyville, IA. Denny worked at various jobs up until 2014. His last job was at Main Street Café. Prior to that, he was employed at Relco and was employed at R & S Sandblasting for many years. Denny loved spending time with his family and friends, especially his grandchildren. He enjoyed being outdoors, doing things such as fishing, riding motorcycles and 4-wheelers, and mushroom hunting. He had a great sense of humor and loved to tell jokes and make others laugh. He will be dearly missed by all that knew him. “To know me is to love me,” and “Better me than you,” were his favorite sayings. Denny is survived by his best friend/wife, Jodi Criswell of Albia; a daughter, Heather (& Justin) Steele of Fremont; 3 stepdaughters: Jackie (& Dan) Criswell of Oskaloosa, Jamie (& Quinten) Brown, of Oskaloosa, and Jessie (& Nathan) Criswell of Eddyville; a stepson, Garrett Luckett of Oskaloosa; 11 grandchildren; 4 siblings: Raymond “Gary” Smith of Avery, Lola Kirby of Eddville, Terry Smith of Fredrick, and Connie Chichester of Avery; 6 nieces and nephews; and many great nieces and nephews. He is preceded in death by his parents, Raymond and Ruby Smith-DeMoss; his stepfather, Lyman DeMoss; a brother, Walter “Benny” Smith; a sister, Carla Smith; a brother-in-law, Terry Kirby and a sister-in-law, Linda Smith. Visitation will be held from 10:00 a.m.-until the time of service on Wednesday, February 13, 2019, at the Tharp Funeral Home in Albia with Denny’s family present to meet and greet family and friends. Funeral services will be held at 12:00 p.m. on Wednesday, February 13, 2019, at the Tharp Funeral Home in Albia with John Van Weelden officiating. Burial will follow services at Pleasant Corners Cemetery in Monroe County. To send flowers or a memorial gift to the family of Denny Lynn Smith please visit the Tharp Funeral Home Sympathy Store.